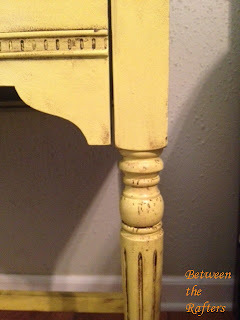 If you are new to my blog you might not remember my first nightstand re-do. You can find that makeover here. 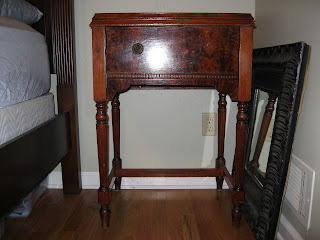 Both the old re-do and today's re-do are sewing tables, sans sewing machines, that I decided to use as nightstands in my master bedroom. While the first sewing table I featured was picked up for free at a yard sale, today's sewing table was picked up for $19.91 at Goodwill. I actually purchased this one first and had been searching for quite some time for one with similar legs when the free one came up. You just can't pass up free! 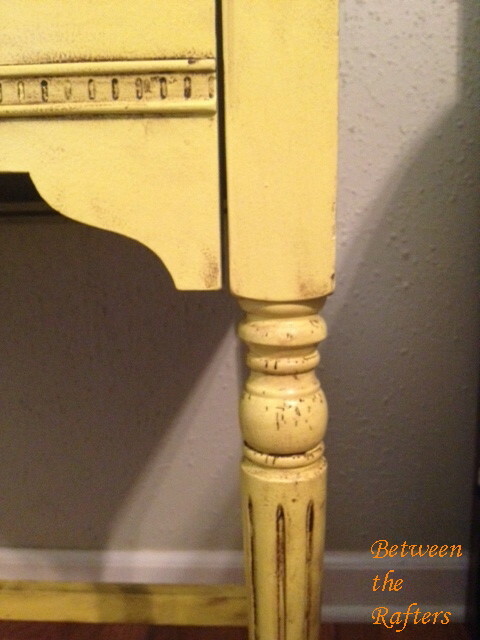 Besides, I'm of the belief that your nightstands don't need to match exactly. It's more interesting that way! Now on to the good stuff! Here is what she looked like when I bought her. 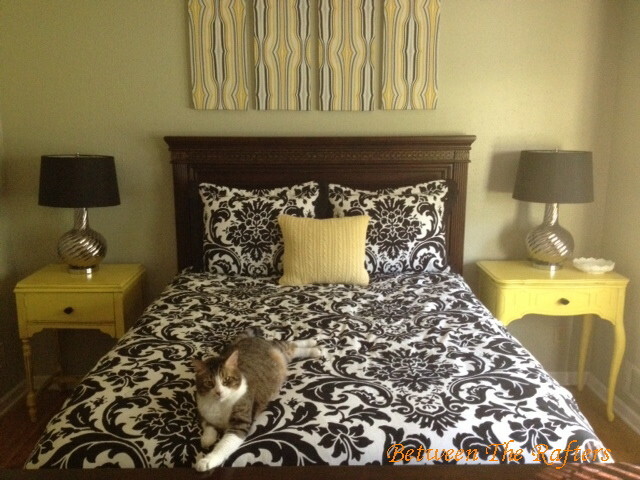 Pardon the unmade bed and the mirror before I gave it a makeover! I just love the detailing on those legs! She was missing one of her knobs so first thing I did was take off the remaining hardware and fill in the holes with wood putty. After she was sanded and primered, I painted her Lemon Twist by Sherwin Williams. 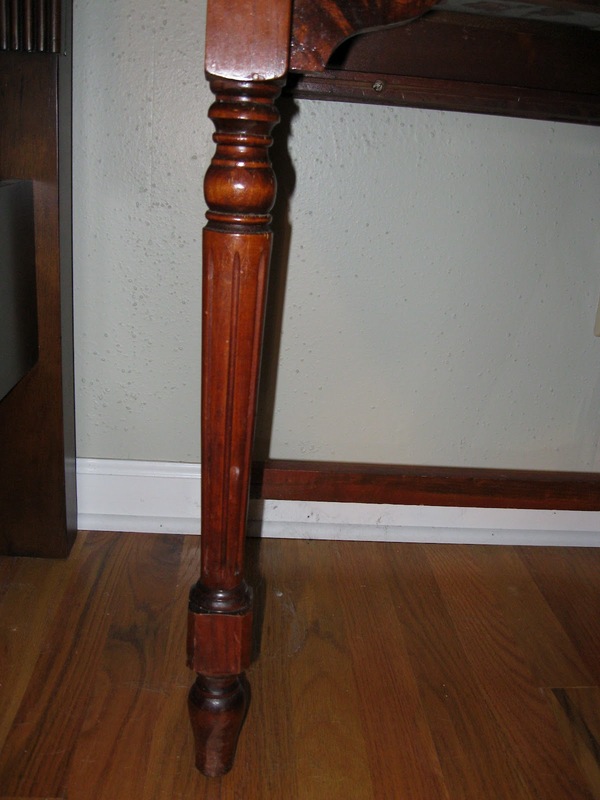 I then applied Briwax in dark brown. This stuff is not nearly as easy to use as the Martha Stewart glaze from last week. It might even be messier too. Both are pretty forgiving though. The Martha Stewart glaze takes a lot longer to dry so there is plenty of time to wipe off and reapply until you have the look you want. The Briwax is very difficult to remove if you leave it for more than a minute or two. Unless...you add more to it. I know it's counterintuitive but if you find you have too much and can't get as much wiped off as you'd like, apply more to it and wipe it off immediately. Seriously. It works! Lastly I had my step-father drill a new hole in the center for her new hardware. And here she is! 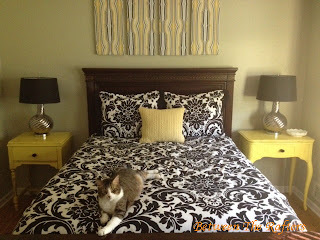 Here is a picture of both of my yellow beauties in my master bedroom. My cat Baxter just had to have his picture taken too :) (The nightstands are actually the same color but the sun was shining in the room from the right side making that one [and the picture] look much lighter.) You'll also recognize the wall hangings from an earlier project. 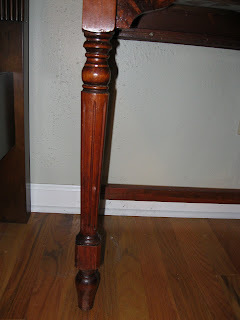 Oh, you did a beautiful job with both end tables! they turned out great! Thank you for joining TTF this week and have a wonderful weekend and a very happy Mother's Day! You should! It would be a great pop of color to welcome people into your home! Very cute! 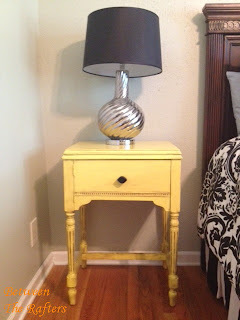 I am now considering doing one of my tables in that color! I'm your newest follower now. Thanks Teresa. It really is a beautiful, sunny yellow. Your table would look good in it :) Now your follower as well! I adore it! 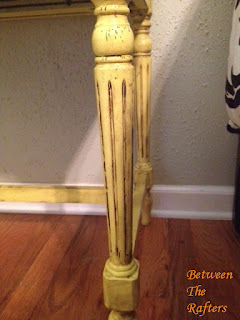 I also love your matching side tables that aren't matchy matchy but still look good together! Thanks for sharing it this week! Hi! 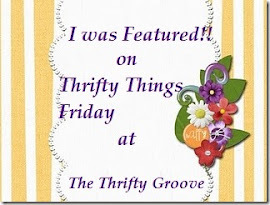 I am back to let you know that I will be featuring this post on this week's Thrifty Things Friday party! I hope to see you again this week and feel free to drop by to grab the "I was featured" button for your blog. Have a great day! Love that color! Where do you get your Briwax? I've wanted to try it because I heard it has no chemicals in it. The minwax works fine, but the "danger, do not inhale" warning is starting to get to me!! lol. Beth, I picked up the Briwax at an antique store in my area. If you have an Ace Hardware near you I'm pretty sure they carry it. You can also get it on Amazon. I've never used Minwax, but the Briwax is a natural wax (beeswax and carnauba wax) and doesn't have an overpowering smell. Very nice redo. LOVE the color. The entire room is just darling. Thanks for sharing with the newbie party. Fabulous transformation! Both of your nightstands turned out beautifully and really look terrific in your room. It looks like Baxter approves, too. :-) Found you through Debbiedoo's Newbie Party. I'm happy to be now following. Have a great night! So long as Baxter can get right in the middle of whatever I'm doing he's happy :) He would have loved the kitty super pack in your giveaway. Thanks for following. Now your follower as well! Thanks Tanya. Love your bread box re-do. So clever. Now your follower as well! I love it~ so charming! Thank you for sharing at Feathered Nest Friday!